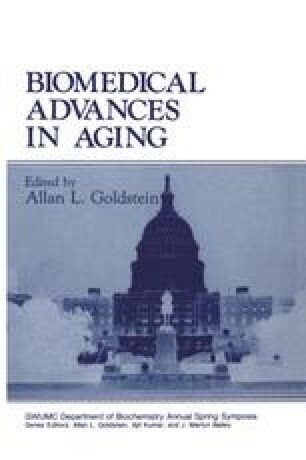 Numerous age-related alterations in immune function and regulation were defined and recently summarized by Makinodan and Hirokawa (1985), Hausman and Weksler (1985), and Siskind (1987). Among the most common are those abnormalities of immune function that are mediated by B lymphocytes. In their simplest form, this may be reflected as a gradual increase in the percentage of sera obtained from presumably healthy individuals from the fifth through and past the ninth decade, which contain monoclonal immunoglobulins. Analysis of sera from 27,000 consecutive blood donors showed that while monoclonal immunoglobulins occur with a frequency of 0.17% in the general population, their incidence increases progressively with age, rising from 0.025% to 0.5% between the ages of 18–29 and 50–60 years, respectively (Fine et al., 1979). Kyle (1984) and others (Radl et al., 1975) extended these observations and demonstrated the presence of serum paraproteins in 19% of individuals 90 years and older. These paraproteins (1) do not involve a particular subset of immunoglobulin; (2) are not confined to a particular immunoglobulin class, their distribution being similar to that noted for a random population of patients with multiple myeloma and for the frequency of occurrence of immunoglobulins of various classes and subclasses in a pool of healthy individuals; (3) do not generally have any demonstrable antigenic specificity; and (4) may be at serum concentrations similar to those found in multiple myeloma (Melistedy et al., 1984). It is presumed that these paraproteins are synthesized at an accelerated rate by an amplified clone of B cells, which may reflect an abnormal immune response.